UW CSE is exploring new frontiers in systems and networking research, which encompasses the fundamental aspects of operating systems, distributed systems, networks, and security. This is a high-impact, collaborative area that reflects a variety of faculty interests and expertise, including: operating systems structure; network and systems reliability; robust protocol design; Internet security and privacy; peer-to-peer systems; mobile and wireless systems; high-performance, scalable cluster-based systems; the measurement of deployed, wide-area systems, such as the Web and content distribution networks; pervasive computing; cloud computing; and virtual machine technology. Noteworthy projects from our labs include: Arrakis, the award-winning operating system that removes barriers between increasingly sophisticated apps and the hardware on which they run for unprecedented customizability, reliability, and performance; Ambient Backscatter, a novel technique for transforming existing wireless signals into both a source of power and a communication medium, eliminating the need for batteries; and Sapphire, a distributed programming platform that simplifies the design and deployment of mobile and cloud applications in today’s heterogeneous environment of smartphones, tablets, personal devices, and variable network connectivity, reducing complexity while providing developers with fine-grained control in building widely distributed, massively multi-user, and eternally persistent mobile and cloud applications. Our record has earned us recognition as one of the best departments for systems and networking research worldwide, and our faculty and students have earned more than 25 best paper awards at major conferences. Visit the Computer Systems Lab and Networks & Mobile Systems Lab to learn more about our work, and explore related research at UW CSE in wireless and sensor systems, computer architecture, programming languages and software engineering, and ubiquitous computing. µLocate from the Networks & Mobile Systems Lab earns the Best Paper Award at SenSys 2018 as the first low-power 3D localization system for sub-centimeter sized devices. Long-range backscatter is recognized with the ACM IMWUT Distinguished Paper Award at Ubicomp 2018. UW Computer Systems Lab and PLSE researchers earn a Best Paper Award at OSDI 2016 for "Push-Button Verification of File Systems via Crash Refinement." 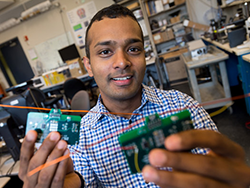 Professor and Jeeva Wireless co-founder Shyam Gollakota talks to MIT Technology Review about backscatter and the Internet of Disposable Things. 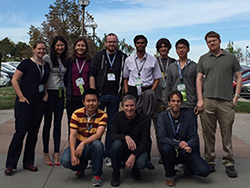 Interscatter is awarded Best Paper at ACM SIGCOMM 2016. Recent Ph.D. graduate Will Scott earns Best Student Paper at USENIX ATC for "Satellite: Joint Analysis of CDNs and Network-Level Interference." The Passive Wi-Fi team captures the Best Paper Award at NSDI 2016. Professor and Ph.D. alum Tom Anderson and Ph.D. alum Albert Greenberg of Microsoft Azure are elected to the National Academy of Engineering.